April 2011 Healthy Diet : Talk on the effects of food on our body. May 2011 Yoga asanas with a Yoga Expert. Recapitulation Quiz at the beginning of every session. July 2011 Aerobics with Music. First Aid + Treatment of simple injuries. First Session : Civil Defense - What to do at the time of Natural Calamities. Second Session : First Aid and how to maintain a first aid box. - A talk with the expert. Third Session : With presence of mind how to tackle any situation / disaster, such as Earthquake, Accidents. Fire drill and Prevention of injury. November 2011 A session with a Traffic Policeman. Learning how to control traffic. January 2012 Living a stress free life. 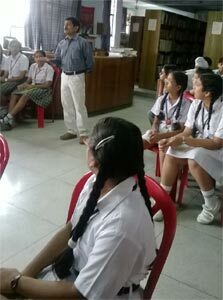 Around 100 students of classes VI, VII and VIII including the member of Wellness Club of St. Mark’s Sr. Sec. Public School, Meera Bagh, attended a Special Yoga session on 20 January 2012 taken up by Mr. Hemant Singh. The students actively participated learning some warm up exercises, asanas, and the 12 postures of Surya Namaksar, the sun salutation. They enjoyed the session and had a lot of querries about how and which particular asanas could help cure some diseases. Thirty Five students of Wellness Club of St. Mark’s Sr. Sec. 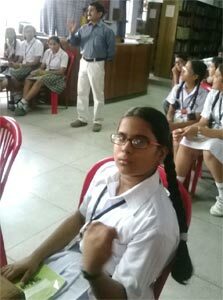 Public School, Meera Bagh, had a special guest from the Traffic Police, Mr. Ved Prakash, on 13 December 2011. He motivated the students to become a source of inspiration to their parents to follow the traffic rules. He also gave wonderful examples on why it is important to obey the rules. Pamphlets were distributed amongst the students, on reinforcing the urgency to follow traffic rules and create an organized and peaceful environment on roads.